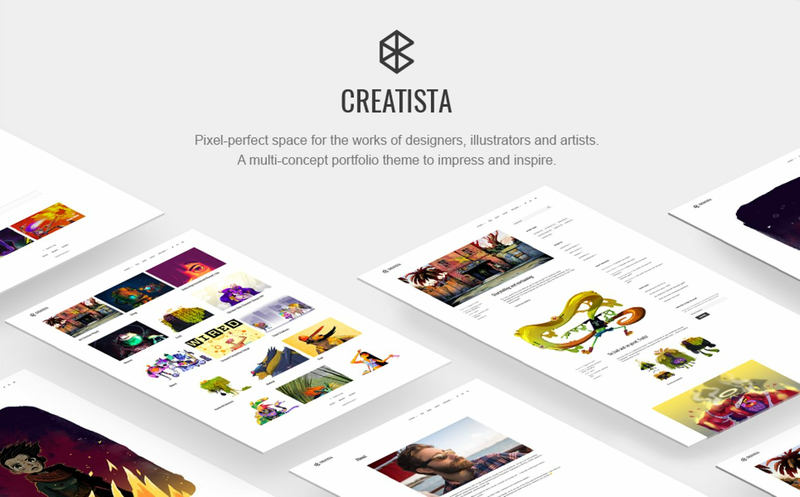 Creatista WordPress Portfolio theme was designed specifically for needs of creatives: visual art, cartooning, comics, animation design, product design, fine art, interior and fashion design, and even more creative fields.Creatista is a combination of a minimal balanced design and a feature-rich Jetpack plugin to power your portfolios. The theme supports different formats of content allowing to create and categorize your design projects of different levels of complexity. You can set different layouts for your projects (one-column, multi-column, etc.) with a help of a flexible Jetpack plugin. It’s also easy to present large charts or product design mock-ups with Creatista.You will also enjoy a beautiful, elegant blog that allows the content to do the talking. The theme is fully responsive - it will deliver even a huge amount of high quality images perfectly to any desktop, mobile or tablet device. If you need to import demo data to ease the editing process, the theme docs will fully guide you through the process.Creatista is WooCommerce ready letting you sell your visual arts easily with the best WordPress ecommerce plugin, which you can install for free.Please note: the images in the theme are used for the preview purposes only.